Are you ready for spring? I know I am. We awoke to a fresh dusting of snow this morning which looked beautiful on the trees when the sun was shining but I am ready for the snow to melt and spring to come. 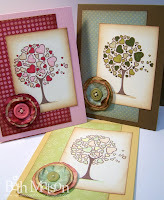 In the spirit of spring, Sally-Ann has some *Spring candy* available on the DigiStamp Boutique blog here. Up for grabs is the March Offer of the Month which includes 5 digi images, and some patterned papers and scalloped cards. Hurry 'cause you only have until March 1st to enter. Also happening on Monday is the release of a new Offer of the Month which includes the adorable little bunny image on the left. 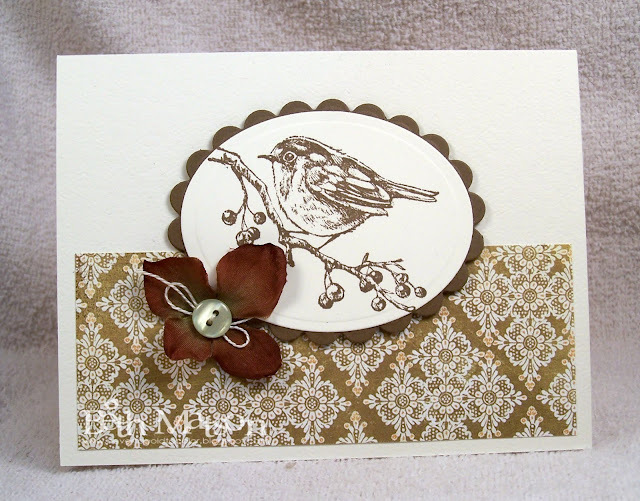 In the meantime I will share a couple of cards using older DigiStamp Boutique images. The first card uses the Becky and Suki image available here. I colored them with Copics. 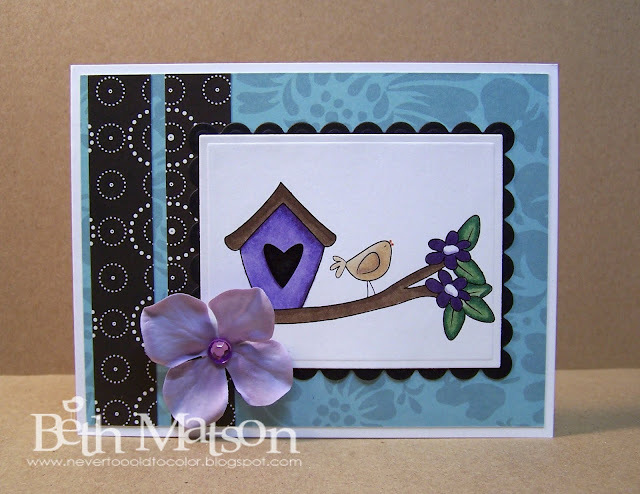 For the second card I used the New Home - Bird House image available here. This image was also colored with Copics. Next week I will have samples using the new March releases to share with you. Happy Wednesday! 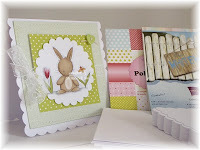 Today I have a trio of cards using Pure Innocence images and Cosmo Cricket papers. 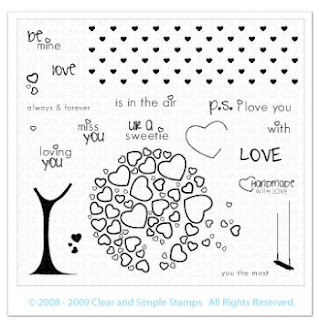 I love the Pure Innocence stamps available from My Favorite Things but was delighted to find some of the images available as digital stamps directly from the illustrator here for a fraction of the price of the clear stamps. The Anniversary party coverage continues on the Clear and Simple Stamps blog. Today they are showcasing the favor box, wine charms, and thank you card. You can see all of the details here. Hopefully you have found some inspiration in these pieces for the planning of your next big event. Thanks so much for stopping. I hope you all have a wonderful weekend! Happy Thursday! Yesterday I mentioned that Clear and Simple Stamps would be showing pieces I created for a 50th Anniversary party. Today on their blog they are presenting part I. You can see all of the details here. I think my favorite piece from this event is the little vellum candle sleeve. 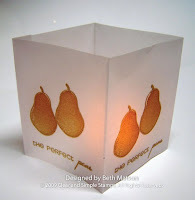 I just love the glow from the battery operated candle through the vellum and the embossed pears. Thanks so much for stopping by and don't forget to check out the CSS blog for all of the photos and details on my projects. Are you helping plan a 50th Anniversary Party and looking for ideas? Maybe I can help. 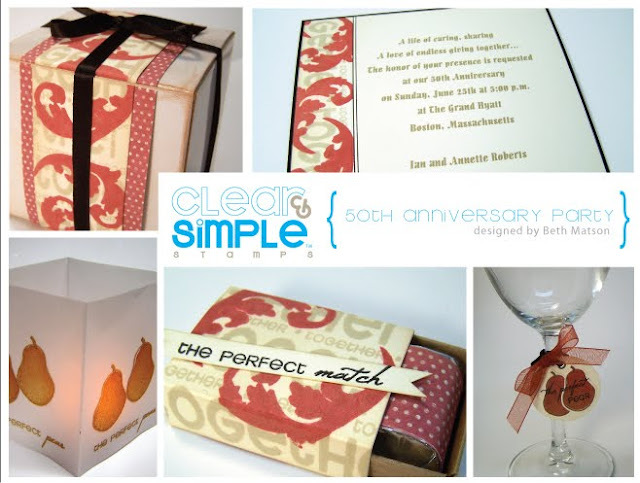 I had the pleasure of creating an anniversary party to showcase the Together stamp set from Clear and Simple Stamps. The individual pieces and details will be unveiled over the next couple of days here. Just a quick post today to share a couple of simple cards using the English Robin stamp from Inkadinkado and my oval Nestabilities sets. I hope you're having a wonderful day! Thanks so much for stopping. Happy Stamping! I had so much fun making the emboss resist card the other day for the Papertrey Ink Anniversary challenge that I made another card. You can find my other card here. 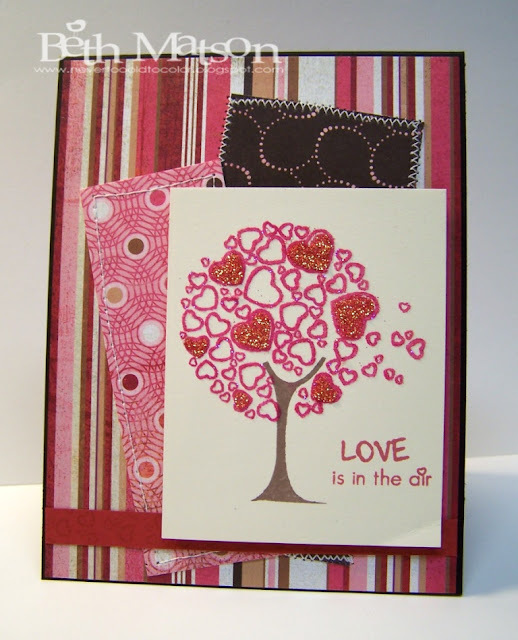 While this card is very similar to the first one the second one uses a sentiment from the Heart Prints Sentiments set stamped in Memento Rich Cocoa on the patterned paper. Next I stamped the small solid heart from Heart Prints over the word heart with versamark ink and embossed it with clear embossing powder. I sponged Distress Ink Old Paper all over the piece to make the embossed heart stand out and then sponged Vintage photo on the edges after roughing them up with my edge distresser.The little silver heart charm is from a package I picked up at Michaels. I colored the heart on the charm with a Copic marker. 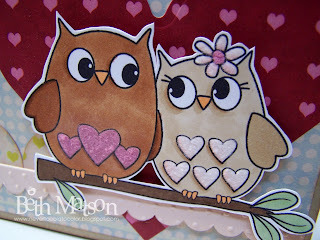 I noticed yesterday that I hadn't shared a couple of valentines I made using digital images from DigiStamp Boutique and digital papers from the Valentine Game night collection by Lettering Delights so I thought I would share them today. I love the bingo cards that come in the Valentine Game night collection so I had to work them into the cards. Both cards use the same layout. 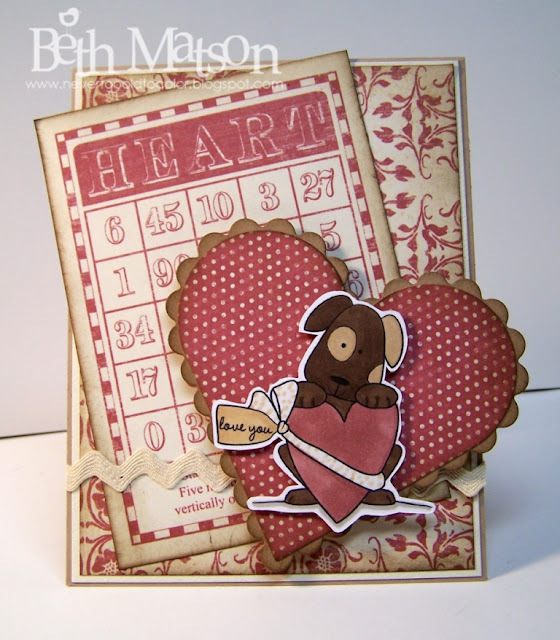 For the top card I used the Valentine Bernard image and added a couple of buttons to the top right side of the card. I also used a darker mat on the base and under the scalloped heart. The bottom card uses the Valentine George image. Both cards use the Spellbinders Nestabilities Heart plain and scalloped and the digital papers from Lettering Delights mentioned above. The images were colored with Copics. Thanks so much for stopping by. I hope you are having a great week. I'm looking forward to the weekend! No big plans but hopefully some time for crafting and a nice dinner out with my hubby. 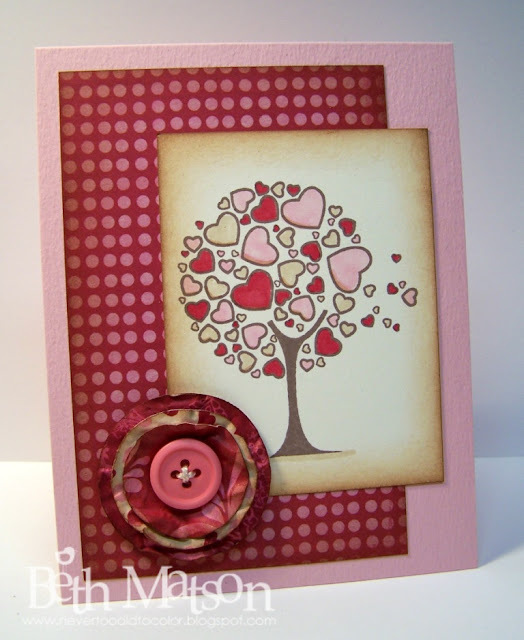 Ok, the other day (see post here) I told you the Sweet Hearts set from Clear and Simple Stamps is great for non-Valentines Day cards but today let's focus on more valentines. For the first card I stamped the little heart background stamp on the top of the card with Old Paper Distress Ink, ran some red cord around the card, then stamped the heart and sentiment with Memento Rhubarb Stalk ink on a scrap of designer paper. Next I inked the edges of the scrap with Distress Ink Vintage photo and mounted it to the card with pop dots. For the finishing touch I added three gemstones to the heart. Very simple card but I really like the end result. For the second card I pulled out the Bittersweet collection of papers from Basic Grey, some Stampin Up glitters and Studio G flocking. I really should put some of these valentine cards that I've made in the mail so others can appreciate them. Thanks for stopping by. I hope you're having a wonderful day. Happy Stamping! 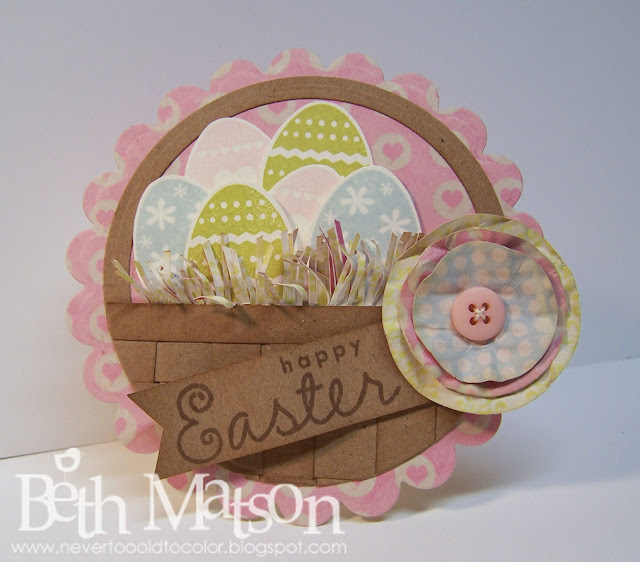 Are you ready for another Easter card? I hope so 'cause I inked up my eggs4Easter set again. 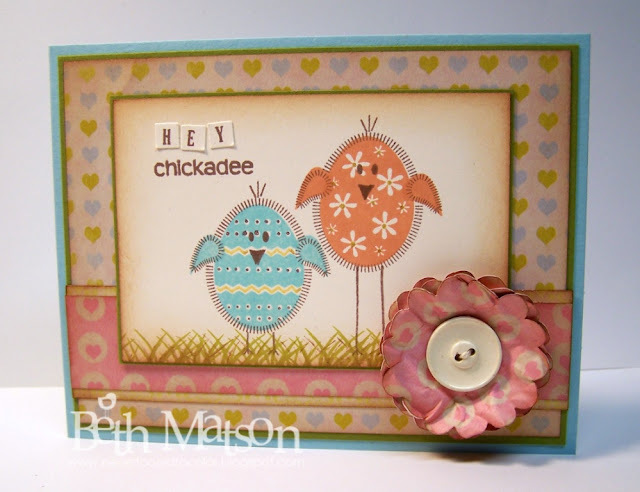 This time I decided to use the chick stamp but instead of just coloring the chicks in with a solid color I used the decorated egg stamps to fill in the bodies of the chicks. What do you think? I used my Twinklette markers to add flower centers on the guava chick and strips and dots on the caribbean chick. I also masked off the caribbean chicks body so I could stamp short legs. Thanks so much for stopping! I hope you're having a wonderful week. Happy Stamping! Stamps - eggs4Easter from The Stamps of Life by Stephanie Barnard, Karen Foster snap stamps for "hey"
Clear and Simple Stamps SOTM for February is the Sweet Hearts set and I wanted to show you that it's great for more than just Valentines projects. Here are three cards I made last night using the same layout. I love how different they each look just by changing up the color schemes. Also if you're interested in the SOTM set you can save $1 by entering Discount Code: CSS0210 (valid Feb 1-28, 2010). Clear and Simple also has a new Copic Trio: Red Trio 3 (R32, R35, R39). There is a $4 savings when you purchase the Sweet Hearts set and the Copic Trio bundle on the bottom of this page. Also if you enter the Discount Code: CSS0210 you will get the additional $1 savings so it would be $25 for the stamp set and trio of Copics. What a great deal! 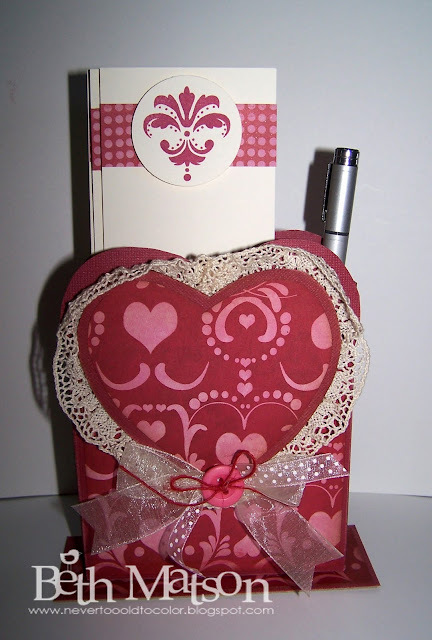 For this version I went with the traditional Valentines Day colors using papers from the K&Company Lovely collection with a base of pink from an unknown vendor. Copics used were E33, E42, R37, R81. Next I did a pastel version. It reminds me of sherbet colors. The papers for this card are from the K&Company Brenda Walton Small Wonders Girl collection with a base of SU Barely Banana. Copics used were E42, YR000, Y00, YG11. 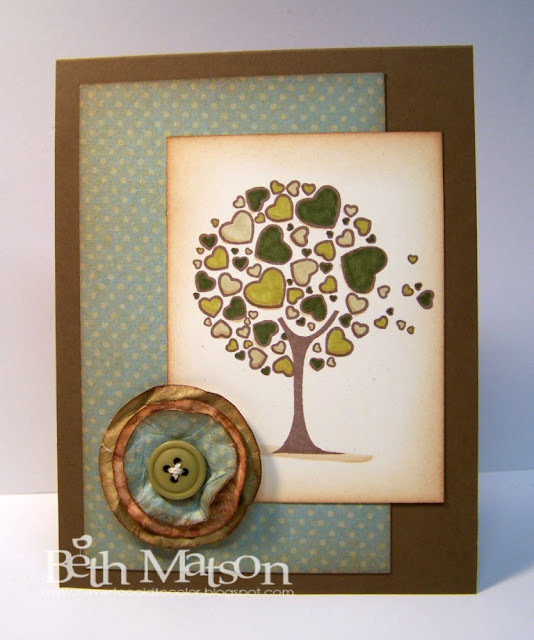 Finally I pulled out my K&Company Classic K Bailey mat pack and made this earthy version of the card. Olive green is a favorite color of mine so I really like how this one turned out. The card base is Soft Suede from SU and the Copics used were G99, YG91, YG95, E31. Thanks so much for stopping by. I hope you're having a wonderful week! Instead of sharing a football themed card with you today I'm going to jump ahead to Easter and show you the little card I just finished. My eggs4Easter set from The Stamps of Life by Stephanie Barnard arrived yesterday and so last night when I couldn't sleep I crept to my craftroom and starting stamping. This was a fun card to put together. I knew I wanted to put the eggs in a basket so I cut strips of kraft cardstock and inked the edges with Vintage Photo Distress Ink. Next I created a weave pattern with the strips and placed them in a circle Nestabilites and ran it through my cuttlebug. To create the basket handle I ran a piece of kraft through my cuttlebug with two Nestabilties circles using just the strip between to two dies. 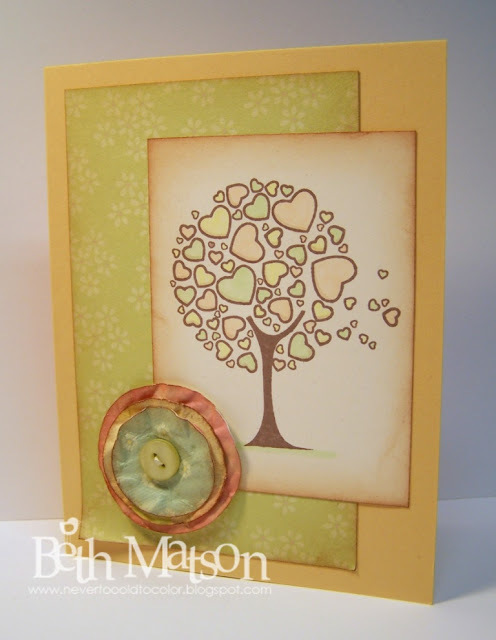 I spent most of the afternoon yesterday creating paper flowers like the one of this card. I keep seeing them on other people's cards so I decided to try making them. It was a wonderful project to do while watching a movie with my DH. I now have a glass canister full of assorted colors of paper flowers with button centers. Thanks so much for stopping by. I hope you're having a wonderful weekend. I'm planning to watch the Superbowl later to see the commercials. Since we're Packer fans I can watch more for the commercials than for the game. Happy Stamping! 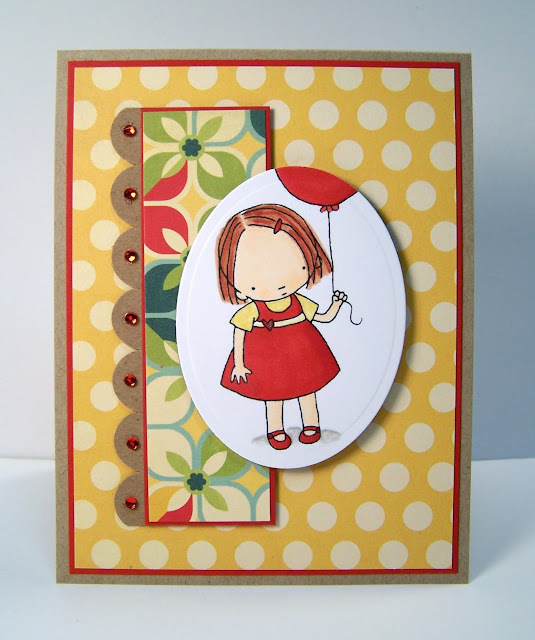 Are you following the challenges for the Papertrey Ink Anniversary celebration on Nichole Heady's blog? 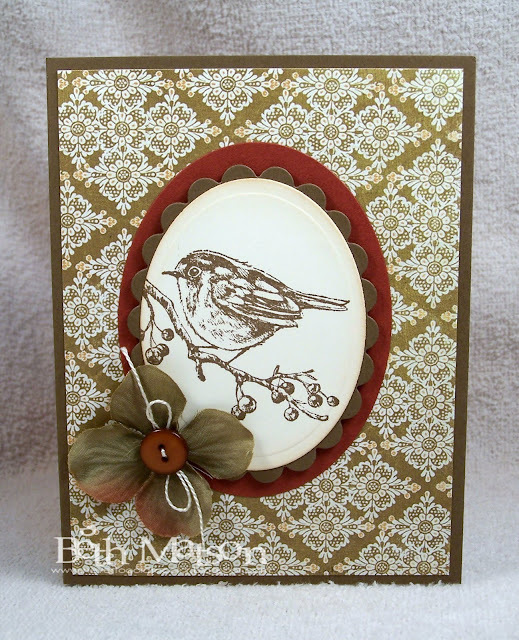 Today's challenge is to create a card using the emboss resist technique so I had to play along. The emboss resist technique is fun and easy. I stamped the solid heart with Versamark ink on a polka dot patterned paper and heat embossed it with clear embossing powder. Next I took my Distress Ink Peeled Paint and sponged it all over the polka dot square. When you're done sponging the ink on you can take a tissue or towel and wipe any excess ink off the embossed image showing where the clear embossing resists the ink. Archival Ink will stamp on embossed images so I used that to stamp my sentiment over the top. Thanks so much for stopping by. I hope you're having a wonderful evening! I have another Valentine to share with you today. 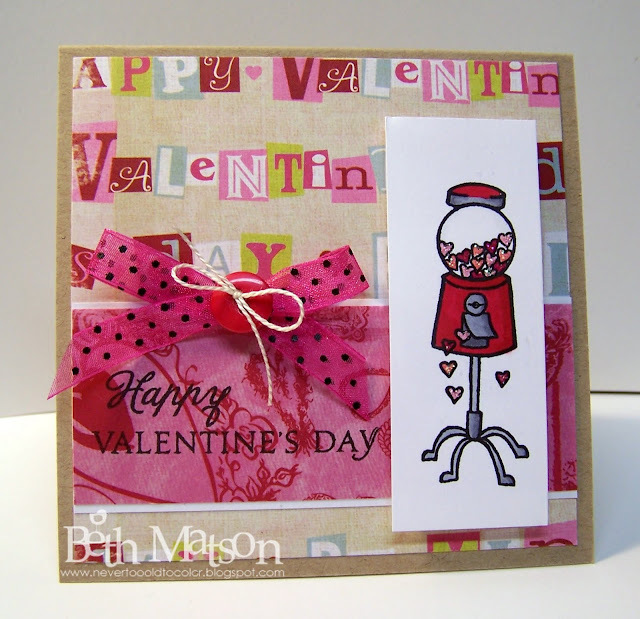 This one uses a cute gumball machine stamp from Great Impressions and more papers from the Lovely paper pack by K&Company. For a little extra something I applied a variety of colors of Stickles to the heart shaped gumballs. The sentiment is from the Heart Prints set from Papertrey Ink. Hope you're all having a wonderful day! Thanks so much for stopping by. Have you ever tried digital stamps? There is an amazing supply of digital images available out there and my favorite place for digital images is DigiStamp Boutique. Check out these adorable Love Owls that were recently released. I printed them on Neenah white, colored them with Copics then added some flocking to the hearts on their tummies and her flower. I cut them out using my Coluzzle knife. For cutting out images I like to use my Coluzzle knife because the little blade swivels and with a little practice I find that much easier to manipulate then a craft knife with a stationary blade. What do you use to cut out your images? Thanks so much for stopping by. I hope your week is going well. Papertrey Ink is celebrating their 3rd Anniversary and as part of the celebration Nichole asked each of her designers to create a birthday graphic that they offered as a free download. For a chance to win a collection of stamp sets people were asked to create a card using the designs. Here's one of the cards I had a chance to make for the challenge. This card uses a graphic designed by Tiffany Pastor. Check out her blog here. Thanks so much for stopping by. I hope you're all having a wonderful week! Papertrey Ink is celebrating their 3rd Anniversary and as part of the celebration Nichole asked each of her designers to create a birthday graphic that they offered as a free download. For a chance to win a collection of stamp sets people were asked to create a card using the designs. Here is one of the cards I had a chance to make for the challenge. 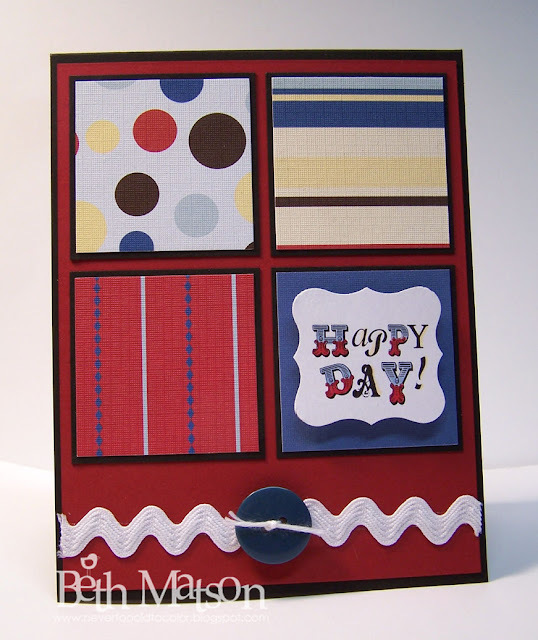 This card uses the graphics created by Alli Miles. You can check out her blog here. You all know by now that along with the first of the month comes a new Stamp of the Month set and free template from Clear & Simple Stamps. 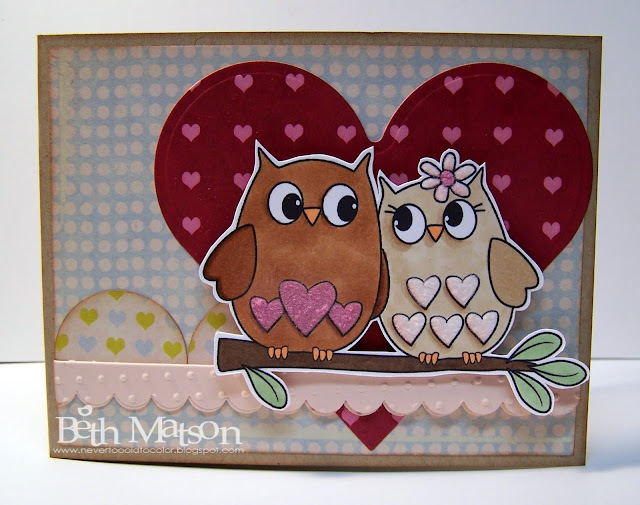 First I'll share the new Stamp of the Month for February: Sweet Hearts. Clear and Simple has also come up with a new Copic Trio: Red Trio 3 (R32, R35, R39). There is a $4 savings when you purchase the Sweet Hearts set and the Copic Trio bundle on the bottom of this page. Also if you enter the Discount Code: CSS0210 you will get the additional $1 savings so it would be $25 for the set and trio of Copics. What a great deal! 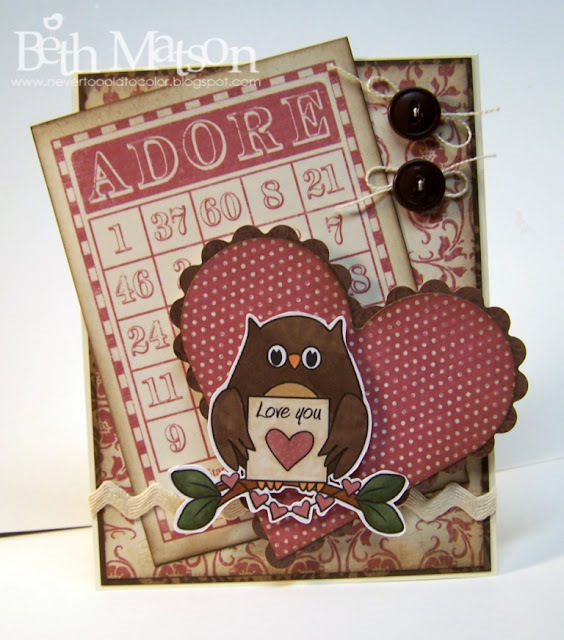 Ok, now it's time to share the February Template of the Month designed by Sue Berker for Clear and Simple Stamps. It's a wonderful Sweet Hearts Box. Sue has even posted directions on her blog Sharing What I Love. For my sample I used Core'dinations paper for the base and decorated it with some papers from K&Company's Lovely patterned paper pack. 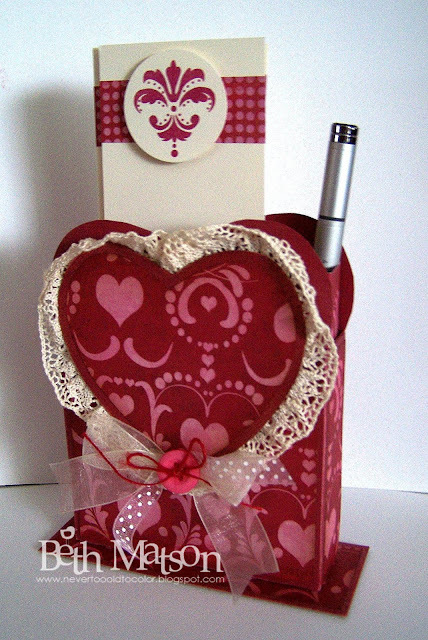 Instead of adding the little pen holder on the front of my heart box I inserted it inside the box and then made tall skinny note cards perfect for making lists. The note cards measure 8 1/2 x 2 3/4 with a 1 inch wide strip of designer paper and then a 2 in circle stamped with a sneak peak of an unreleased set from Clear and Simple Stamps. 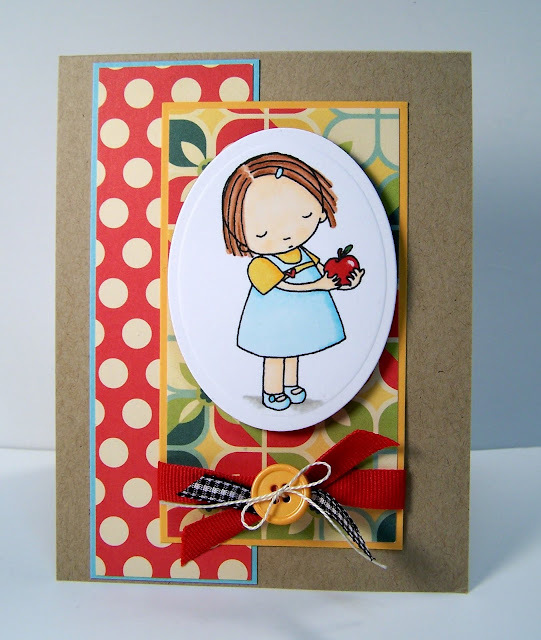 Not only is this a really cute template but the best part is it's FREE! 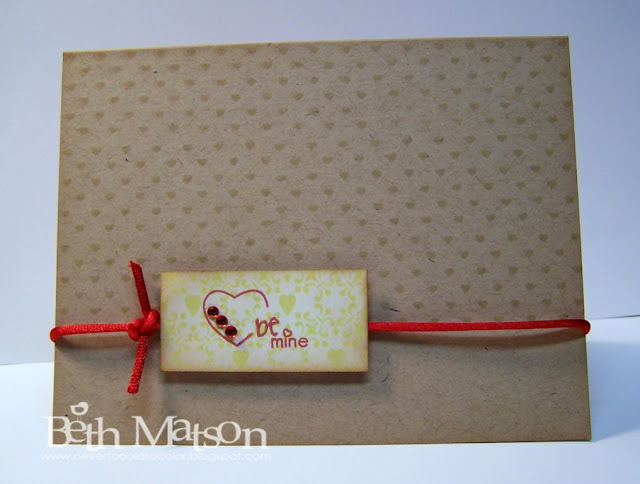 Be sure to visit my fellow Design Team members blogs for more inspiration and samples of the Sweet Hearts Box Template. I hope you're all having a wonderful Monday!